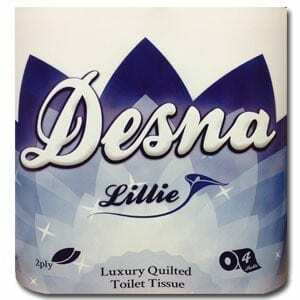 Desna Lillie 2ply Toilet Rolls – 40 Pack (10x4pk) with quilted embossed pattern. Loorolls.com’s most popular 2ply Toilet Roll – Desna Lillie is a luxury 2ply Toilet Roll that compliments every bathroom. Made from ethically sourced pure tissue our Desna Lillie is perfect for everyday use at home or in the market place. Being our own brand we have sourced the finest tissue to compliment our brand. Desna Lillie 2ply is glue embossed to enhance the thickness of the roll & to enhance the softness.